Many bottlenecks are recognised in the development of the closed life-cycle aquaculture of the Southern Bluefin Tuna (Thunnus maccoyii; SBT). These include difficulties associated with handling the broodstock, and the long time it takes individuals to reach sexual maturity. Firstly, to overcome these difficulties, the use of anaesthetics was identified as a means to potentially minimise risks associated with handling large broodstock SBT (>100 kg), which is a critical component of their aquaculture. In this study, the efficacy of two anaesthetics, in combination with an antidote, was examined for SBT. Both anaesthetics effectively anaesthetised the SBT and the antidote successfully reversed its effects. The technique is currently used by Cleanseas Tuna Ltd to assist with current handling practises of their broodstock SBT at their facility in Arno Bay, South Australia. Secondly, understanding the potential differences in reproductive development of the captive reared SBT to wild populations is important to evaluate when sexual maturity can be expected in captivity. 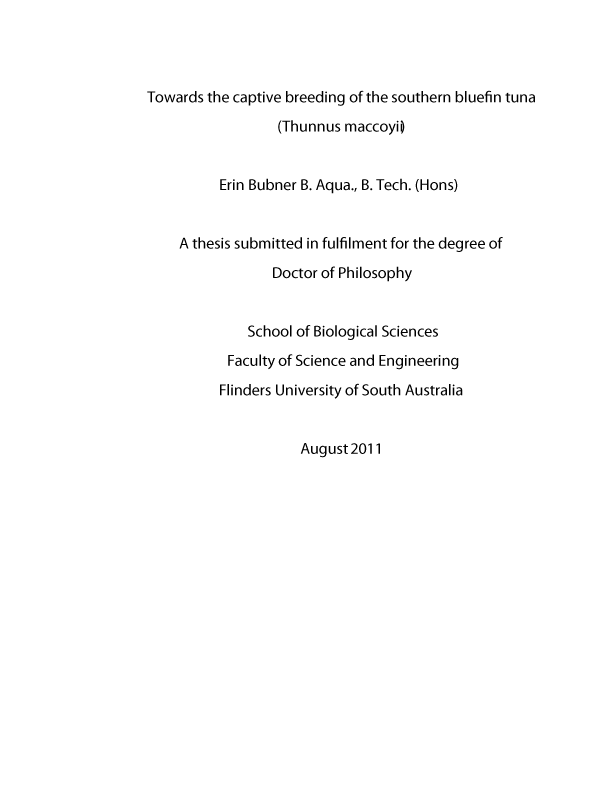 The reproductive development of two groups of captive reared SBT was examined: (1) smaller and younger production SBT from sea cages offshore of Port Lincoln, South Australia; and (2) larger and older broodstock SBT from sea cages offshore of Arno Bay and in Cleanseas Tuna Ltd onshore breeding facility. The third aspect of the study examined an alternative two prong approach to maintaining large sexually mature SBT broodstock as a source of seed. Currently, the number of broodstock SBT that can be held in Cleanseas Tuna Ltd onshore facility is limited due to their size (>100 kg) and availability of sexually mature fish (approximately 8 to 10 years old). Two areas were investigated to address this issue: (1) the use of hormonal manipulation to advance the age of puberty onset; and (2) the identification of a suitable surrogate host, into which SBT germ cells can be transplanted and develop in the gonads to form SBT sperm and eggs. In both cases a smaller and younger fish will be used, increasing access to manageable broodstock, therefore dramatically reducing the space required to rear them and the associated costs.